Toshiba today announced the latest ultrabook U840W Satellite name. Unlike the usual ultrabook, Satellite U840W use 21:9 aspect ratio (1792x768 screen). While for the size of the LCD screen is the same as most other laptops, which is 14 inches. In its launch, Toshiba Satellite U840W emphasizes that has an unusual screen. With the aspect ratio, the laptop screen is claimed to be the first laptop that can play movies without black bars. Aspect ratio of the extra width also makes the applications that run side by side in Windows 8 can perform better. Satellite U840W weighs under 1.8 pounds and 0.81 inches thick, while the claim " all day battery 'Toshiba seems accurate. 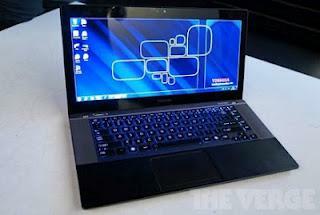 Ultrabook uses an Intel Ivy Bridge and supports up to 10 GB RAM and 500 GB hard drive and 32 GB SSD. Satellite U840W will be released in the third quarter of this year and priced below $ 1,400.